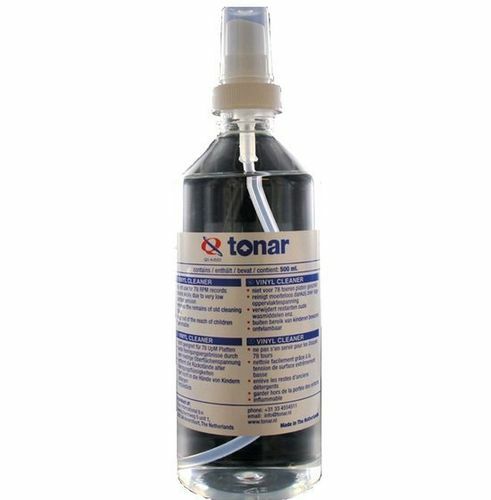 The Tonar QS Record Cleaner Spray is a high quality cleaning fluid for deep cleaning of vinyl records, supplied in a spray can for conveniently cleaning small batches of records, ideally in unison with the Tonar Wetgoat record brush. Dirt, dust and grime can clog the grooves of your favourite records, and seriously hamper the sound quality you experience. A high quality cleaner such as the Tonar QS, can have your records sounding as good as the day they were new! (Important: Do not use with old 78 RPM shellac records as the liquid may cause damage). Tonar liquid has an extremely low surface tension. Only because of this can the liquid penetrate right to the bottom of the groove where other fluids seem to penetrate, but actually just lie on top of the record surface. Only Tonar liquid cleaner soaks the dust, dirt, air pollution, residue from previously used cleaners, fatty deposits remaining from the original record pressing process, even fungi and moulds caused by records having been stored in humid conditions etc. Tonar liquid detaches all of the mentioned dirt from the walls of the groove after which the brushes in the machine can easily wipe completely clean. It also has another property causing the dirt to remain floating in the liquid rather than settling back at the bottom of the groove.